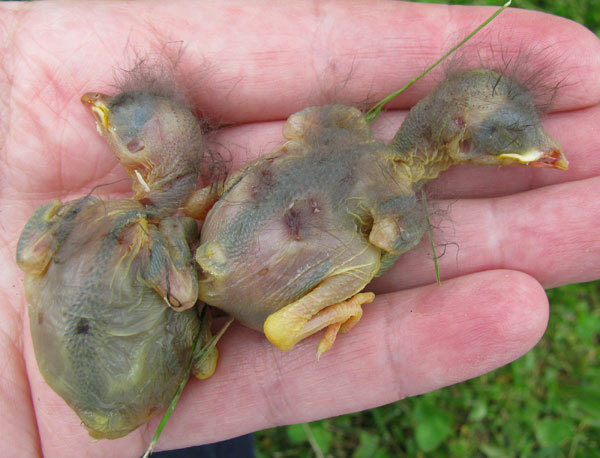 These Eastern Bluebird nestlings were killed by House Sparrows (HOSP.) They were found underneath the box. Notice the peck marks on the head, beak, and either side of the spine. The one on the left appeared to have a broken neck. See more photos and descriptions of HOSP attacks. The box is located on an experimental trail where HOSP are not trapped. Instead, HOSP nests and eggs are removed on a weekly basis. The trail consists of six single-holed boxes, and four double-holed boxes (Two-holed mansions) on what I call the Hill Trail. See 2009 trail log and history below. It is a HOSP-infested location. This is the third year of the experiment. This nestbox where this attack occurred was protected both by monofilament stretched tightly on either side of the hole, and a sparrows spooker that was installed when the first bluebird eggs was laid. On my other trails, I trap HOSP as soon as they attempt to use a box, and have never lost a nestling or an adult bluebird to a HOSP attack. Before this, I had never experienced a HOSP attack in a box protected by a sparrow spooker. I still highly recommend sparrow spookers in combination with other active and passive HOSP control methods, due to their strong track record. In 2006, before I adopted the trail, 7 existing single-holed boxes were used by HOSP. In 2007, the single-holed boxes were plugged. I installed five two-holed mansions (donated by Linda Violett), to see if I could duplicate her success with Western Bluebirds nesting in HOSP-infested areas where no trapping occurs. The boxes were hung in trees. One was stolen. Two had failed Tufted Titmouse nestings (HOSP or House Wren attacks). One box had a single late bluebird nesting which successfully fledged two young. Flying squirrels occupied one box. Any HOSP nests/eggs were destroyed. In 2008, the single-holed boxes were unplugged, apparently by the person who installed them in the first place. Again, no trapping took place - HOSP nests and eggs were destroyed. A bluebird successfully produced three broods in the single-holed boxes. Each of her nests was protected by a sparrow spooker. A dead adult House Wren was found in one box, sitting on eggs, cause of death unknown. A chickadee nest was lost, probably after the mother was killed by a cat. Other single holed boxes has HOSP attempts. Of the four remaining two-holed boxes, one had a failed titmouse nesting (House Wren attack suspected.) Two were occupied by flying squirrels. One had a successful nuthatch nesting. Another two-holed hanging box was stolen, but Tom Comfort made me a new box which I tried as a pole mount. Of the four double-holed boxes, three are hung in trees, and one is on a pole. Of the tree-hung boxes, one is being used by a nuthatch, one is occupied by a flying squirrel, and one is vacant. The pole-mounted box is also vacant. I have spent a lot of time and effort removing HOSP nests and eggs for the past three years. In the meantime, those boxes were unavailable for use by native birds. By allowing HOSP to attempt to use boxes nearby, I probably exposed the nesting bluebird to increased danger. It is possible (no way to know for sure) that repeated removal of HOSP nests and eggs resulted in increased HOSP aggression, prompting the attack on a box that was protected by both monofilament and a sparrow spooker. (Some monitors refer to this as a "rampage." ) The results were deadly. Apparently it was just a matter of time until luck ran out. My experience is consistent with what Paula Ziebarth found on an experimental trail where no trapping occurred, but HOSP nests and eggs were removed. A number of Tree Swallows were killed when they attempted to use boxes that they "believed" were unoccupied. As a result, I do NOT plan to continue the no trapping part of the experiment in 2010. 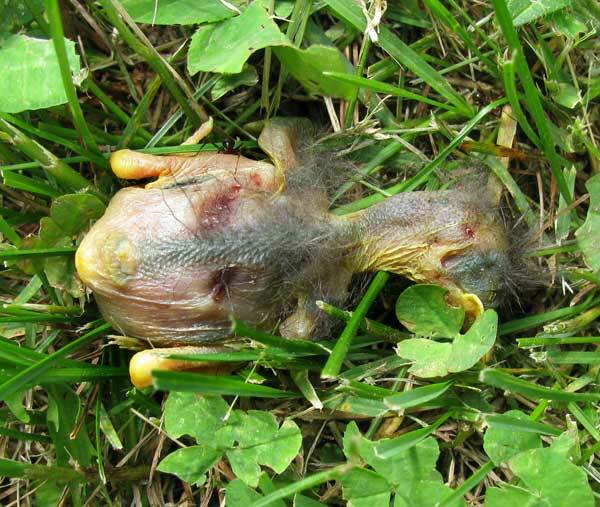 In my area, bluebird nests are too few and far between to take this kind of risk, and it is too dangerous for the bluebirds. However, I feel that the experiment was informative, and still believe alternatives are needed for people who are unable to or choose not to trap HOSP (probably about half of all people with nestboxes fall into this category). The two-holed hanging mansions do not seem to hold much appeal for bluebirds based on usage to date. Titmice and nuthatches seem attracted to them, therefore I would recommend their use for those species. Two holed boxes probably do increase the odds that a bluebird could escape from a HOSP attack if they were able to break free from the HOSP's crushing beak and leg holds. Bluebird eggs and nestlings have no such option. separate webpages with drawings and photos on sparrow spookers, Magic Halo, and How to Trim Wings and Links for more information and DIY drawings.